The establishment of formal diplomatic relations between the United States and the People’s Republic of China in 1979, together with Chinese Vice Premier Deng Xiaoping’s economic reforms, inaugurated a decade of vibrant cultural exchange and expanding economic ties between the two countries. 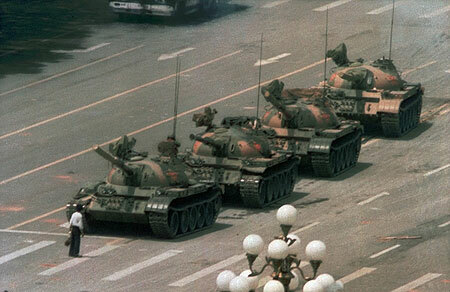 However, the Chinese Government’s violent suppression of demonstrations in Tiananmen Square on June 4, 1989, cooled U.S.-Chinese relations considerably. To the present day, the Department of State marks the anniversary of the suppression by issuing a statement calling on the Chinese Government to end harassment of those who participated in the protests and to fully account for those killed, detained, or missing. The demonstrations began on April 15, when Chinese students gathered in Beijing’s Tiananmen Square, where so many student and mass demonstrations had taken place since the early 20th century, to mark the death of the popular pro-reform Chinese leader Hu Yaobang. The demonstration became a forum to protest corruption and inflation, and call for broader political and economic reforms to build on the reforms that had already transformed China considerably in the post-Mao era. The Chinese leadership was divided on how to handle the demonstrations. As the numbers of protesters swelled to the tens of thousands, some leaders who saw the protests as a direct challenge to Communist Party rule labeled the demonstrators “counter-revolutionary” in an April 26 editorial in the government-run People’s Daily newspaper. Other officials sympathetic to the protestors’ demands for political reform favored a conciliatory approach, as represented by General Secretary of the Communist Party Zhao Ziyang’s visit with protestors on May 4 to hear and acknowledge their concerns. Soviet General Secretary Mikhail Gorbachev’s impending state visit on May 15 invigorated the protests. Some protestors initiated hunger strikes to increase pressure on the government. Foreign media that arrived to cover the visit turned their attention to the protests and heightened international—especially Western—awareness of the protesters and their demands. The crowds in the Square grew beyond students to include a broad segment of Chinese society, from workers to ordinary citizens from Beijing and beyond, and reportedly exceeded one million in number. Gorbachev’s visit occupied Chinese officials’ attention until his departure on May 18. On May 19, Zhao visited the protesters once more to make an emotional appeal for hunger strikes to end. The Chinese leadership imposed martial law in Beijing on May 20. The protests continued. On the night of June 3 and 4, the People’s Liberation Army stormed the Square with tanks, crushing the protests with terrible human costs. Estimates of the numbers killed vary. The Chinese Government has asserted that injuries exceeded 3,000 and that over 200 individuals, including 36 university students, were killed that night. Western sources, however, are skeptical of the official Chinese report and most frequently cite the toll as hundreds or even thousands killed. Similar protests that had taken place in other Chinese cities were soon suppressed and their leaders imprisoned. In the aftermath, President George H.W. Bush denounced the actions in Tiananmen Square and suspended military sales as well as high level exchanges with Chinese officials. Many members of the U.S. Congress, the American public, and international leaders advocated broader economic sanctions, some of which were implemented. U.S. leaders met with Chinese nationals studying in the United States as a symbolic gesture of commitment. Questions of relations with China, in particular the granting of Most-Favored-Nation trading status, were controversial questions for the remainder of President Bush’s term and into the term of President Bill Clinton.